Vahan Kerovpyan, 30, is a musician in the collective Medz Bazar. 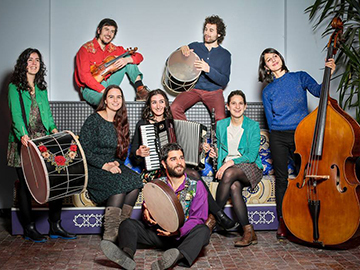 Created in May 2012, this band is a cluster of eight musicians from various origins (French, Armenian, Turkish, American) who revive traditional classics and play their own original compositions. In this interview, Vahan recalls his travels around Turkey and Armenia, how he felt in relation to Armenians living in those two countries and to the Turkish civil society. He also comments on the lyrics of the Medz Bazar songs and shares his vision of the future of Armenians, in the Diaspora and elsewhere. His rather positive outlook stands in contrast with the ambient pessimism of part of the community who think that Armenian identity and culture are dying out. REPAIR: What are your family origins? Vahan Kerovpyan: My father is from Istanbul, and so are his parents, but my great-grand-parents on my father’s side are from four different areas of Asia Minor. My mother is half Armenian and half American, born in the United States, and her maternal grandparents are from Kessab, Syria. On her father’s side, the origins are mostly English, with a touch of Scottish and Alsatian. I’m a genuine mix. I have been quite active in the Paris Armenian associative world, in particular the Terre et Culture organization and in the French-Armenian educational workshop MGNIG which I joined at age 5, when it opened, in 1990. I was one of the first children in that workshop and I spent all my Saturdays there since childhood until adulthood. It turned into a circle of friends, a place where we would play, think and create in the Armenian language. So, we actually grew up together, sharing many experiences and the common base of the Armenian language. Of course it gave me a strong linguistic foundation, but it was also at MGNIG that I met some of my closest friends. Then I moved on to the “adult” role of facilitator, mediating language and reading sessions as well as drama, comedy and music workshops. What kind of ties do you keep with Turkey? I had a period between 2006 and 2010 when I used to go very often – as often as I could. It was a revelation. First, Istanbul is the city where my father was born. I have family there. Then, I met many Armenians who became close friends, and through them I met Turks and Kurds… During that time, my sisters and I made many friends and hung out with some progressive people in Istanbul. Then, in 2008, we took our first trip to the East with a few friends, to the ancestral lands. What did you think of that journey? Like for many other people, I believe, it was quite upsetting. It shook many of my frames of reference, even though I think those were rather flexible from the start, as is often the case with descendants of Armenians from Istanbul. With them, you’re not limited to that notion of “Turkey as an enemy” because Turkey is also where their father or mother were born – a city with some nice memories, with real people, and not just seen as a sort of faceless monster. So, I was rather open-minded, but nevertheless I also carried whatever you learn in the Diaspora. So I was apprehensive and, like it or not, many things turn out as you feared they would. There is a very palpable hatred. At state level, it is loud and clear and its position hasn’t budged. Then there is the pain of coming towards something that totally eludes you. For instance, when you come across ruins or a fountain with writing in Armenian or even a grandma speaking Armenian – such situations really come as a shock because what was abstract suddenly becomes real. And that reality which kicks in, you don’t know what to do with it at first. Hence my travelling back and forth, to give it time. Along the years, I experienced things differently by travelling with different people every time. We finally managed to materialize something. At first it was only sort of scouting locations and then, with my sisters and friends, we took part in the rebuilding of fountains in Habab with members of the Hrant Dink Foundation. It enabled us to put our hand to some concrete task, I mean to try and feel ourselves as being part of that reality and not just some strange and helpless witnesses. I experienced a similar feeling with the Medz Bazar musical collective last year when we toured from Istanbul to Erevan through Elaziğ; Diyarbakir, Mardin, Dersim, although I had already visited most of these places before. Once again, I felt that I was doing something real there, that we were in touch with people and could share our work. These are the small things that helped make the experience more down to earth. How did you view Turkey before going there? Initially, there was this fear that it might be dangerous. And indeed, if you are not careful as an Armenian, you can find yourself in rather unpleasant situations, even though it is now worse for Kurds. Still, you do meet scary people (laughs) or situations that fuel the fears that we might already have as Armenians from the Diaspora. However, when you are out there, this fear turns more into a form of awareness, of vigilance, which you can acknowledge but should not yield to completely. Despite everything that draws me to Turkey – and these things are many! – to me, the country still comes across as rather hostile. Domestic news are hardly ever good news. It’s a country which I find both attractive and infuriating, and even more so since I have known it from within. Today, I am also aware that the election results or other such news have a direct impact on my friends; shelling in Diyarbakir or elsewhere concerns us more personally now that we know those places. Do you follow Turkish current events? And if so, how do you analyze the changes in Turkey, in particular in its civil society? The situation is rather distressing despite the efforts that can be seen. There have always been so many efforts in Turkey, but it’s hard to remain hopeful of the advent of democracy if there isn’t any fundamental change at government level. Even with the movements which can be seen within the civil society? These movements – and some of them are very brave – are marginalized, if not crushed. They must exist, as there is no other option, but of course at their own risks. And this does create a form of change. Some people will gain a more individual and less national awareness. I think and hope that there are more and more supporters of a freer mindset, people who manage to think by themselves without being subject to a nationalist or Islamist or any other dogma. However these dogmas are dominant in Turkey because its society is entirely built upon those beliefs. So it’s hard to be positive. However, being pessimistic doesn’t help either. How do you view the Armenians of Istanbul? I am under the impression that there are several trends. If some of them, epitomized by Hrant Dink, expose themselves to the society and the power in place through political or cultural actions or activism, many are extremely discreet and silent. I don’t think that we can judge them as being timid because they are effectively put under pressure by their country, their regime and their society. We are not well considered, so either you engage in active resistance or you choose passive resistance, which means that you do your thing discreetly. I find that many Armenians who don’t do political resistance are nevertheless active in their own way, through cultural resistance. They maintain the notion that they are Armenian, they keep up their institutions, their families so that something is passed on from one generation to the next. That is also a form of resistance. Whether they are afraid or not, they finally exist. These two trends may be in opposition on the ground, but they are also complementary. I have discovered Armenia through actions with the Terre et Culture NGO, mostly in rural Armenia. Therefore, I happen to know the country better than if I had stayed in Yerevan. Being familiar with the capital – and essentially with downtown Yerevan – is not the same as knowing Armenia. The rest of the country is very, very different. Before going to Armenia, what was your perception of that country? It was a very abstract country for me. My father had been there in the 1990s, so I had a notion of a tiny and quite different country, full of unique cultural and referential resources, which meant that to go there was something else altogether. And the Hayastanci [Editor’s note: Armenians from Armenia] who came to France gave us a first insight of what it was like. Then, as with Turkey, there is a series of prejudices on Hayastan [Armenia in Armenian]. These prejudices are both positive and negative, such as: everything you find there is authentic culture vs people there are too different; everything is wonderful vs they are all crooks; we are brothers vs we don’t speak the same language, etc. There is also that rhetoric today about our hayrenik [fatherland in Armenian] – that it’s there and it’s all we have, that we must bet everything on that place… You hear all kinds of confusing statements about Armenia. Do you feel close to Armenians from Armenia? It depends. I would say that, yes, I feel that they are my brothers and sisters in the sense that we share a culture, a past, and hopefully a future. We also share the present time as much as we can. I feel a sense of belonging, more than with non-Armenians. But then, it doesn’t mean much. If we keep to general statements, I could say that I have less in common with a Hayastanci than with an Armenian from Alep or Beirut, or maybe even less than with a Parisian from any ethnicity. But on an individual basis – that is, in reality – it can be the reverse. It’s not an easy question to answer. Regarding your song “Notre patrie” (Our Fatherland), about Diaspora Armenians who go to Armenia just to party, why such a song? What do you want to say to that famous “mass”? I think that the idea is to rock the boat a little. We wanted to express ourselves about something disturbing. We also talk about our own experience – at least for the Armenians of the band. We don’t say: “We know and you don’t, we do things right and you don’t.” We state facts and call for reflection and for action! Towards the end, you all sing “Rebellion, pacifism, regaining confidence…” What does it mean? It’s a general observation and our statement concerns both the Diaspora and Armenia. Without directly connecting this position with today’s current political movements, we take a stand in favour of the idea of rebellion, of action, in the face of today’s stagnation. It’s a state of mind that we are trying to defend, they are not specific appeals to join such movement or fight for one thing or another. In the song “Ariur Ar Ariur”, you take up the theme of the Armenian identity. Is it a provocation or rather an attempt to put out in the open what nobody wants to say publicly? A provocation yes, but not a gratuitous one. It’s a provocation to let off steam, to relieve ourselves. Every time we play it on stage, I find a rage within me which fuels my performance. A positive rage, full of humour. When people hear that, it makes them laugh. They recognize that rhetoric. Everyone in the Diaspora recognizes the character that I like to play and who makes me laugh. His speech was created from things that I have heard around me. It’s a rather cynical song. To me, the portrait I make is not something I want to criticize. It’s something I want to laugh at. I think it is good stuff for a song and that we can laugh about that. Because all I say in the song are often things we tend to cry over: Ah, Armenian is not spoken anymore; ah, all these marriages with non-Armenians; people do this and that… But if we manage to laugh at that kind of talk, it already deflates it a little. “Armenian identity is nothing more than sujuk [Editor’s note: spicy dry sausage] and lavash bread [traditional Armenian bread]”. Do you really think that? It is a widespread general statement, although not in these exact terms, and which should not be generalized. There are plenty of Armenians who are not just sujuk and lavash and can very quickly convey other references. Because of our history, it’s often an effort to feel comfortable as an Armenian. It’s not something that comes easy. When you don’t have the means to make that effort or when you aren’t aware of that problem, your identity doesn’t happen automatically. There is a lot that gets lost, and that is lost, but it has been the case forever. I for one find many references around me. I am lucky to master the Armenian language, and it’s something I wish on future generations. Having access to the language as I’ve had is a tool to access the culture. “There is no longer anyone to embody our nation.” What do you mean by that? It means roughly that there are no more soldiers for this nation. In fact, there is a widespread attitude, in particular among the most influential people in the communities, of turning all the above-mentioned questions – speak the language, go to demonstrations, go to church, marry with an Armenian, etc. – into a national duty instead of seeing them as issues to solve in a more natural, positive way. Everything that drives my character mad is all that you hear from those who pretend to save the Armenians. But their final assessment is that it’s too late, that we won’t manage to save ourselves… which is the opposite of what I think myself, but it’s what my caricature persona thinks. “What have we become? / What were we before?” Can you comment these words? We all have a legacy that we can’t handle anymore. But as soon as you say that, you ignore a lot of people who do live their culture fully, who have access to it and innovate. More and more, I meet Armenians of my generation, from all over the world, who speak really good Armenian – whether they were born in the Middle East or not – and who will, I believe, ensure the future of the intellectual elite of tomorrow that some people are so worried about. We may be less focused on how to maintain Armenian culture, but are we even sure of that? There is a pessimistic rhetoric that I find totally useless, and that’s what I make fun of in the song. You draw a very positive picture of the future of the community. First of all, it is a response to what I can hear around me because, even if it were true that everything is going to collapse, it’s pointless to say it. So why predict the end? The only thing it does is to discourage, to disengage people. It causes the young people who hear that and are not determined enough to fight that thought, to just give up without even trying. So I think that there is something irresponsible in that rhetoric. Too many people churn out that kind of speech. In the end, I think that we have trouble with change, with letting go a little, with trusting and telling ourselves that yes, a lot is getting lost… At the same time, what do you want to do? What was lost in the genocide cannot be recovered. So much has vanished and will still vanish, and that’s tough. But no-one should minimize what is still ours. If you really look at it, it you look at how dynamic Armenians are in so many fields, there is a lot to keep us going.